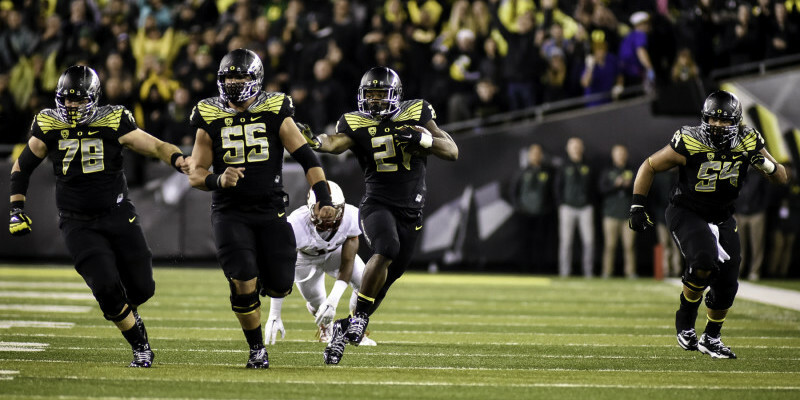 Can Royce Freeman Give UO Back-to-Back Heisman Winners? Last year the University of Oregon had its first Heisman trophy winner in history. Marcus Mariota finally took Oregon over the hump and won the award. There have been years in the past where an athlete from Oregon was in the running, but never the clear-cut favorite. Mariota ended that long Heisman drought. Previewing this coming football season, SI.com has already arrived at several candidates to take home the next Heisman trophy. 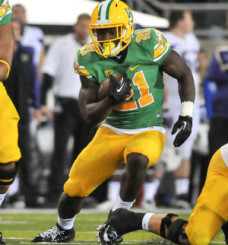 And on that list is Duck running back Royce Freeman. Freeman had a standout freshman campaign last season with the Ducks, recording 1,365 yards and 18 touchdowns on 262 carries. He now isn’t just a freshmen running back — he’s a respected running back and possibly one of the top backs in the Pac-12 conference and the nation. 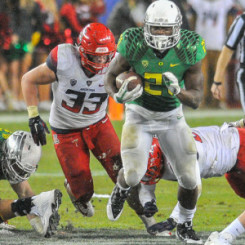 Royce Freeman eluding defenders during the Pac-12 championship game. What are Freeman’s chances of giving Oregon back-to-back Heisman winners? Here are some factors that would contribute to him getting an invite to New York City next December. Since Mark Helfrich took over the head coaching job at Oregon, the passing numbers for the offense have gone up compared to Chip Kelly and Mike Bellotti’s passing numbers when implementing the spread offense. Kelly did have Mariota running the offense his last season at the helm, but the offense was still a run-first offense. Once Helfrich took over, those numbers changed. He began to incorporate an offense that threw the ball much more than Kelly’s offense. The obvious reasoning behind that was that he had an experienced quarterback. Unfortunately, Mariota is now gone and the quarterback position is the biggest question mark of the 2015 season. Here is where the running game will pick up. Oregon returns all of the running backs that had the majority of the touches a year ago. Because a lot of them are returning, it gives the offense a veteran presence in the backfield that can take a lot of pressure off whoever is at quarterback. This is where Freeman’s number of touches and yardage should go up. Royce Freeman shifting his way through a hole against Washington. Oregon returns most of the wide receivers from a year ago and also returns a handful of offensive lineman with legitimate game experience. The combination of this could give Freeman a better chance than most backs in the nation. Defenses have to respect the guys on the outside with the passing and screen threats, and because of that, it allows the offensive line to work with more space, creating bigger holes for running backs. Respect for the playmakers on the perimeter would cause the opposing defenses to spread themselves out and not able to put eight guys in the box to defend the run. As mentioned before, even though they lost some key starters, the offensive line returns many guys with experience. Oregon will have players who know the system and who have been in critical game situations. Because of this, they should play with a different attitude than last year. Combining the experience on the offensive line with proven play-makers on the outside gives Freeman a great opportunity to tally a lot of yards this coming year. Royce Freeman scores against Florida State in the Rose Bowl. Along with Freeman in the backfield are other highly-touted backs that will take some touches away from Freeman. Thomas Tyner is Freeman’s compliment back that will receive a lot of carries this coming season – and he should. Tyner has proven himself and as long as he stays healthy, he and Freeman will be a fearsome twosome in Oregon’s backfield. At the same time, neither player will be considered an “elite” back because they take carries away from each other. Besides Tyner, Oregon will always have plays drawn up for other playmakers to get their hands on the ball. Ex-running back Byron Marshall could line up in the backfield, as well as other receivers. Finally, another impressive option is sophomore Charles Nelson, who will see time in the backfield as well as at corner on defense. It may not seem like a lot, but due to the amount of talent Oregon has on the offensive side of the ball, it will be hard for someone other than a quarterback to gain legitimate national recognition. Considering both plus and minus factors, Oregon has a great chance to continue seeing the Heisman trophy up close yet once again. The Ducks have a lineup long on talent, and players such as Freeman are no exception. The type of talent that’s already receiving high praise around the nation — is worth supporting. So now, it’s time to sit back and see what Freeman, and the Ducks, have in store for 2015.